My precious: Cranking so hard with a rachet strap that you break the kayak. DON’T USE RACHETS. You will need: standard cam tie-down straps (8′ min.). Easily found at hardware stores, sports stores, or online. Center the kayak so the balance point is between the racks, right-side up, bow facing forward. On Seawolf Kayaks, the balance point is always just behind the front of the coaming. Even if the kayak looks like it is sticking out farther back than you would like, you must center it. Tip the kayak towards you so it’s resting on the keel and the outside chine/stringer. Feed the strap underneath the bar on the far side of the kayak. 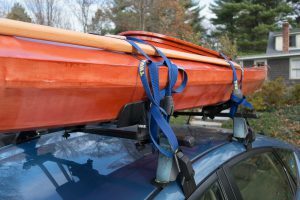 Bring both the loose end and the cam end overtop the kayak towards you, so you have two parallel straps running across your kayak’s deck. Adjust the cam to the top of the gunwale, to give you space to tighten down. Feed the loose end under the bar, through the cam from bottom to top, and cinch it down. Don’t tighten yet. Repeat steps 3-6 at your second bar. Once both straps are on, tighten each one. Cinch the straps down tight. When you try to move your kayak side-to-side or up-down, your car should move on its shocks. DO NOT USE RATCHET STRAPS. It is hard to over-tighten regular cams with simple arm strength. It is VERY EASY to over-tighten ratchets. Daisy chain the loose ends, or tuck them in your car doors to avoid flapping. 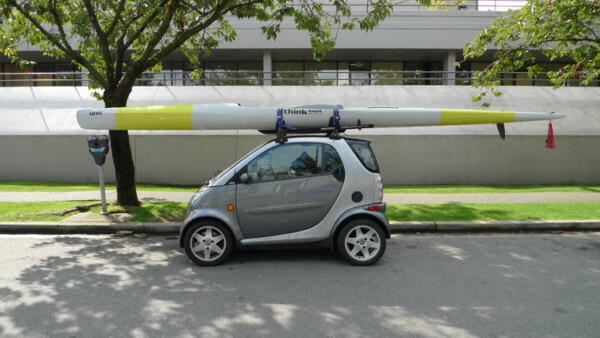 As my mom would say “don’t throw bad money after good.” I have never really understood that expression, but I’m pretty sure it means this: if you’re going to invest $2,000 in a sea kayak, its worth the additional couple hundred bucks for a roof rack to transport it safely. Anytime you have to strap through your roof instead of strapping to a rack directly means the straps will not resist lateral wind forces. Acceptable but just barely. Not sure which tower system you need? Get your car fitted at Yakima or Thule. Stores like ReRack in Portland resell car racks if you’re looking to save some bucks. Our reliable permanent choice: A proper third-party car rack with towers and straight bars: our choice for versatility and ease of use. If we’re not hauling kayaks, it’s lumber, box springs, more lumber, plywood, etc. Worried about scratching your keel on the bars? We wrap our bars in neoprene, or you can slap on a couple of foam pads under the keel. If you insist on using your Factory Racks: Foam Blocks for your curved Aero Bars. Your bars are bouncy, not all that strong at their attachment point. But it’s fine for a couple of SOF kayaks. Cheap and Great: Block Rack. You have a separate webbing strap to tie your straps to, and you can adjust the foam. Great idea, just a bit inconvenient, can carry your kayaks or or water toys SUPs. Alternate: HandiRack inflatable car rack. Haven’t tried them out personally, but they seem to be OK once you get them adjusted. Pros: Nice and tall for kayak use. Cons: limited use, good for a 26# SOF, not for much else. Cheap, Most likely we will give you stern looks: Foam Blocks without a rack. Your straps go around the kayak and the roof so that’s not good for side winds. Alternate: In a pinch, slide some cam straps through a couple of pool noodles. Instant roof rack! Not for heavy loads, but will support your 26# SOF. Pros: cheap. Cons: you’ll need to look into the road legality yourself. Kiliii’s Jeep has a gloriously long rack frame, which makes tying down a breeze. My little Matrix, on the other hand, has bars a mere 30″ apart. This means the longer kayaks will shift side-to-side no matter how tight the straps. We have these commercial handy toggles fixed to a webbing loop that are made to sit securely under your car hood. Simply place them on either side on the edge of your engine frame, and shut the hood so the loops are sticking out… à la hippo ears! DIY: In place of toggles, you can make your own quickie hippo ears but tying a stop-knot in a short piece of thick rope. Bear in mind that the knot will be close to your engine, so avoid any heat sensitive materials that will leave you with a melted mess on your engine block. Also, if you tie your own, remember that the knot has less holding power than the commercial style with toggles. 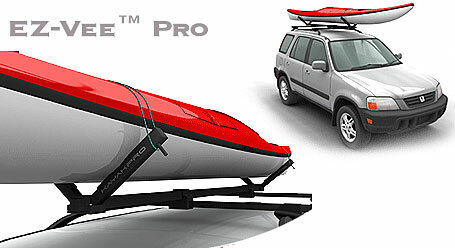 For cars with short rack bar distance: The Kayak Pro EZ-VEE. With a long cab, treat the cab roof like the roof of a short car. 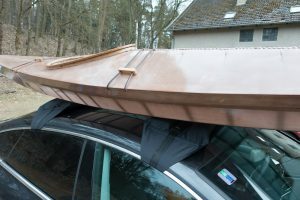 Tie on to a rack in two places, then secure the bow and/or stern via the hood system (see LONG BOAT/SHORT CAR above), and securing the stern with a line tied to D-rings in the bed. 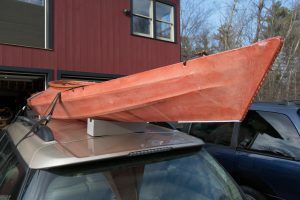 If you have a short cab and you MUST, you can lay you kayak flat in the bed, using a tailgate extender to support the stern. Just be extra careful when backing up. And don’t forget to flag it. The BEST option, however, is to have a bed rack that will allow the kayak to sit level on the cab roof on the front, and rack in the back. These racks can be pricy, unless you build your own out of studs. 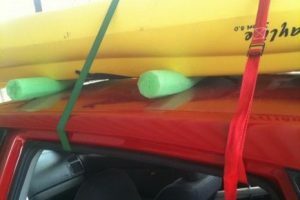 Or if you prefer, a video of the 30 Minute Pickup Kayak Rack. Just be sure you’re securing it down properly. And finally… don’t forget to flag it! *If you don’t have it already, I highly recommend the Knot Guide app. It’s worth the $1.99 to knot have ads, which can really put a hitch in your experience.